A small piece of leather provides material evidence for the origin of an otherwise common parchment binding. 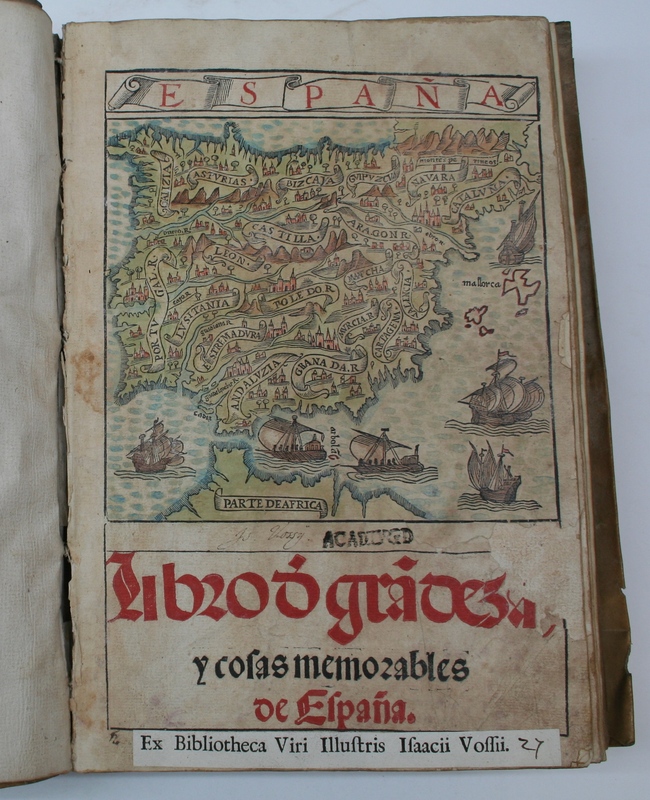 The Libro de grandezas y cosas memorables de España by Pedro de Medina was printed in Sevilla in 1548. It has a hand coloured title page with a woodcut from the Iberic peninsula and numerous other woodcuts throughout the book. The book, now kept under shelfmark 1368 D 5, once belonged to Isaac Vossius (1618-1689) but lacks any older owner inscriptions. Was the simple parchment cover applied in Vossius’s time or can we trace it back to earlier times? Establishing date and origin of plain parchment covers is often more difficult than that of decorated bindings. Tooling patterns and individual stamps have been studied for quite some time and thus these features can be instrumental in tracing the history of books. Nevertheless, also modest and unembellished bindings contain specific characteristics. Although plain limp parchment covers were manufactured from the South to the North of Europe, each region appeared to have had its own binding tradition, on the basis of which the origin of present binding can be determined. The textblock is sewn on three alum tawed (white) leather supports and the endbands are sewn on a core of allum tawed skin as well. The parchment cover is attached to the textblock by lacing the slips of both sewing-supports and endbands cores through the parchment in the joint. This was a common method to produce cheap yet durable bindings from the fifteenth century onwards. What distinguishes this binding is that the parts of the tawed leather slips that are visible on the outside of the cover, seem to be rather slack in stead of being pulled tight. Only the upper support at the lower cover shows no signs of slackness because a piece of brown, tanned leather sticks tightly underneath. At first sight this structure appears to be meddled with. However, it turns out that precisely this tiny piece of tanned leather proves that this binding is not inferred with at all. In Spain a particular method was used to strengthen these limp parchment structures. Broad straps of tanned leather were applied, just a bit wider than the spine width so as to extend over the joints. These straps covered the outside of the cover spine over the sewing-supports and were laced on with the slips of those supports simultaneously with the cover. Their function is similar to the usage of a locknut or washer underneath a nut. Notwithstanding its clear purpose, the use of this method remained limited to a relatively small region. Reason for the limited use may be that the external leather straps were considered too vulnerable to damage. In any case, the present binding has nearly lost all traces of this technique, were it not for the small leather fragment. The binding is now being kept in a clamshell box, in order to preserve this fragile piece of evidence. Much thanks are due to Prof. Nicholas Pickwoad, who verified the original technique. For those interested in other material characteristics, see for example his article ‘Onward and downward: how binders coped with the printing press before 1800’, A Millennium of the Book, (1994), 61-106.